In a medium mixing bowl, combine Bisquick and cold butter using a fork or pastry cutter. Don’t combine too thoroughly – there should be small chunks of butter in your mixture. Mix in cheese, milk and garlic powder by hand, only until combined. Drop 1/4 cup portions onto an ungreased baking sheet and bake for 15-17 minutes or until golden brown. In a small bowl, combine melted butter, garlic powder, parsley and salt. 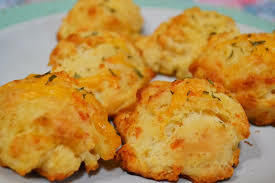 Brush the garlic butter on top of the biscuits, making sure to use all of it. Make the sauce by heating 2 tsp of vegetable oil in a medium saucepan over med/low heat. Don't get the oil too hot. Add ginger and garlic to the pan and quickly add the soy sauce and water before the garlic scorches. Dissolve the brown sugar in the sauce, then raise the heat to about medium and boil the sauce for 2-3 minutes or until the sauce thickens. Remove it from the heat. Slice the flank steak against the grain into ¼" thick bite-size slices (Tilt the blade of your knife at about a forty five degree angle to the top of the steak so that you get wider cuts). Dip the steak pieces into the cornstarch to apply a very thin dusting to both sides of each piece of beef. Let the beef sit for about 10 minutes so that the cornstarch sticks. As the beef sits, heat up one cup of oil in a wok (you may also use a skillet for this step as long as the beef will be mostly covered with oil). Heat the oil over medium heat until it's nice and hot, but not smoking. Add the beef to the oil and sauté for just two minutes, or until the beef just begins to darken on the edges. You don't need a thorough cooking here since the beef is going to go back on the heat later. Stir the meat around a little so that it cooks evenly. After a couple minutes, use a large slotted spoon to take the meat out and onto paper towels, then pour the oil out of the wok or skillet. Put the pan back over the heat, dump the meat back into it and simmer for one minute. Add the sauce, cook for one minute while stirring, then add all the green onions. Cook for one more minute, then remove the beef and onions with tongs or a slotted spoon to a serving plate. Leave the excess sauce behind in the pan. In a large heavy skillet heat the vegetable oil until it is hot but not smoking and in it stir-fry the scallions, cabbage, celery and bean sprouts for 3 minutes, or until the cabbage is wilted. Add the sugar, broth, soy sauce, and sesame oil and simmer the mixture, covered, for 3 minutes. Stir the cornstarch mixture, stir it into the vegetable mixture, and bring the liquid to a boil. Season to taste with red pepper flakes. Simmer until heated through and serve over noodles. Cut beef into thin strips . 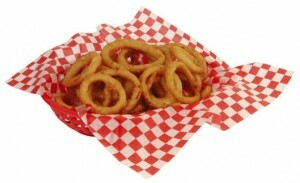 In a bowl of sealable bag combine all marinade ingredients and mix well. Add beef slices and marinate for 15 minutes. 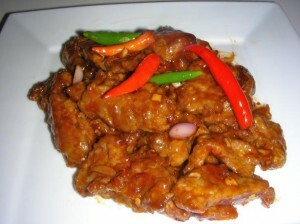 While beef in marinating mix all of the sauce ingredients together in a bowl and refrigerate. When the beef is done marinating coat the beef slices with 6 tablespoons of cornstarch. 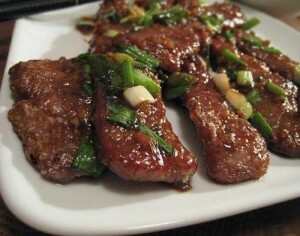 Remove any access cornstarch and deep fry (either in a deep fryer or wok) beef slices in batches until floating or golden brown. Drain on paper towels. Add a couple tablespoons of oil to the wok and add minced garlic and stir fry for 10 seconds. Add red and green bell peppers and onions and stir fry for 2 minutes. Remove vegetables and set aside. Pour sauce into the wok and heat until boiling. 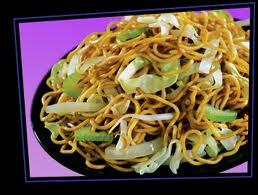 In a serving dish add beef and vegetables and coat with the sauce. Heat three tablespoons of olive oil over medium heat in a large soup pot. Saute onion, celery, garlic, green beans, and zucchini in the oil for 5 minutes or until onions begin to turn translucent. 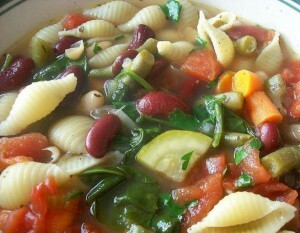 Add vegetable broth to pot, plus drained tomatoes, beans, carrot, hot water, and spices. Bring soup to a boil, then reduce heat and allow to simmer for 20 minutes. Add spinach leaves and pasta and cook for an additional 20 minutes or until desired consistency. Makes about eight 1½ cup servings. et rise at least ½ hour. While dough is rising, prepare a baking soda water bath with 2 cups warm water and 2 Tbsp baking soda. Be certain to stir often. After dough has risen, pinch off bits of dough and roll into a long rope* (about ½ inch or less thick) and shape. Dip pretzel in soda solution and place on greased baking sheet. Allow pretzels to rise again. Bake in 450 degrees F oven for about 10 minutes or until golden. Brush with melted butter and enjoy! Toppings: after you brush with butter try sprinkling with coarse salt. Or for Auntie Anne's famous Cinnamon Sugar, try melting a stick of butter in a shallow bowl (big enough to fit the entire pretzel) and in another shallow bowl make a mixture of cinnamon and sugar. Dip the pretzel into the butter, coating both sides generously. Then dip again into the cinnamon mixture. Enjoy! * The longer and thinner you can make the dough rope, the more like Auntie Anne's they will be. *Sweet butter, not regular butter, is one of her secrets! Mix all ingredients except for ice. 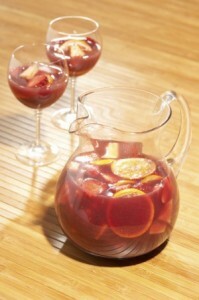 Pour sangria in glass and then add ice. Make sure there is fruit in every glass. In a large saucepan melt together butter, flour, and chopped onions. Cook butter an flour together for about a minute, and then slowly add in half and half. Add about 1 quarter of the half and half, whisk until thickened and smooth. 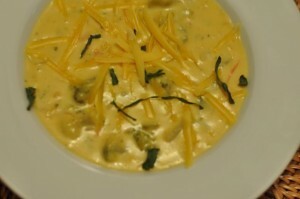 When all of the half and half is incorporated add frozen broccoli, and American cheese, when the cheese is completely melted, add chicken broth one cup at a time until soup is well mixed and has a consistent texture. When all of the chicken broth is added add carrots, and simmer soup for about 20 minutes. During the last 10 minutes of cooking add the 8 ounces of shredded cheddar cheese. Serve when all cheese if fully melted. Place above items on counter in order listed. Dip onion in water, then flour (shake off excess), dip in melted ice milk, then corn meal. Gently shake off excess and place on cookie sheet to air dry for at least 20 minutes. Sifting the flour and corn meal once in a while keeps lumps out and makes it easier to coat the rings When placing on cookie sheets to save room, lean on top of each other to allow entire ring to dry. Red Lobster $10 Fish Fry Friday! FrugallyDelish is a participant in the Amazon Services LLC Associates Program, an affiliate advertising program designed to provide a means for website owners to earn advertising fees by advertising and linking to amazon.com, audible.com, and any other website that may be affiliated with Amazon Service LLC Associates Program. As an Amazon Associate [I or we] earn from qualifying purchases.